A. Great question, Sydney! TalkPath Therapy and TalkPath News are both free online therapy tools offered by Lingraphica. They can both be used to improve memory and cognition. Our TalkPath Therapy platform contains over 13,500 communication and cognitive exercises throughout six different categories. With our reporting function, you can keep track of your progress and see where areas of improvement are. It's the perfect tool for those with communication disorders as well as speech therapists. TalkPath Therapy can be accessed via computer or iPad®. It is also available on our AllTalk® communication device. You can access TalkPath Therapy by clicking on the "Therapy Activities" icon on the AllTalk homepage. TalkPath News is our dedicated, online news platform, which features current articles in a communication-device-friendly format. The articles are designed with auto-reading and auto-highlighting options. Articles are organized into eight different categories, which means there is something for everyone! We have also included multiple-choice questions at the end of every article to test memory retention and cognition. TalkPath News is available via computer, iPad®, iPhone®, Android devices, and all three Lingraphica communication devices. 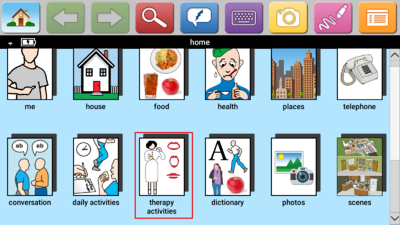 You can find TalkPath News by clicking on the "Therapy Activities" icon on your device's homepage. A. Hi, Peter! We're happy to hear you're considering a Lingraphica communication device for your father! Below are two videos showing various stroke survivors and those with communication disorders using Lingraphica communication devices. All the people shown in these videos have different physical and verbal capabilities; however, they are all communication device users, and each person uses his/her device differently. They aren't the only people who are successful communication device users. Click here to download our Success Stories eBook and read about how these amazing people incorporate their Lingraphica communication device throughout their daily lives. A. Angela, you're in luck! 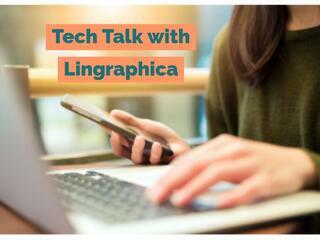 We offer free device training for everyone who receives a Lingraphica communication device. Our training comes in a number of different offerings that are all focused on teaching users and their communication partners about our communication devices and how to properly use them. You can learn more about the free device training here. Lingraphica's ACE Program is our virtual user guide which is filled with easy-to-follow tutorial videos explaining the different sections of our devices as well as practice exercises where users repeat the steps in the video on their device. Users can also register for free, live webinars with one of our certified device specialists. Our ACE Program is now available on all three of our communication devices. The program icon can be found on the device's homepage. Lingraphica also offers free webinars for communication partners who are new to the world of communication devices and speech disorders. The webinars allow you to hear the questions other caregivers have and also allows you to ask your own questions directly to a certified speech-language pathologist. The reason we offer so many training resources is because we want to make sure our customers and their communication partners are getting the most out of their communication devices.